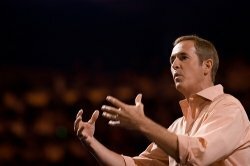 I admit it … I’m a fan of Andy Stanley and North Point Ministries. I still remember the first time I visited their Alpharetta, GA campus nearly 10 years ago. It was one of those perspective shaping experiences. I came away from that interaction with North Point looking at “church” in a totally different way. The thrust of the book is “creating churches that unchurch people love to attend” and Andy is backing up the fact that North Point is actually doing that. In the appendix of the book he even opens up the stats so you can poke around under the hood a little bit. Andy spends a bunch of time in the early part of the book looking at church history and how the “church” degenerated from being a vibrant movement to meaning a building or place or worship. It’s so refreshing to see a forward thinking leader so grounded in where the church has come from. When I read this … I literally had to stop and re-read it three or four times. Andy is shooting from the hip for people who are involved in teaching and communications at church. He’s pushing us to teach with application as the purpose of communication. Love it. This is the core of a section on how North Point creates irresistible environments for people. It’s so simple … but these three questions are incredibly powerful in creating leverage in our evaluation of what our ministries actually do. Again – ouch, that hurts. In what area of my ministry am I self delusional about it winning when it really isn’t? I sat and thought about that for a long time. This idea has crawled up under my skin recently. I look around at a lot of what we do at Liquid and I feel like it was innovative at a time … but when will those ideas actually work against what we are attempting to do? In what areas am I looking at our current practices and mistaking them for enduring principles? Am I an agent of fossilization? These are just a few of the quotes that I pulled out when reading this book … hopefully to whet your appetite to actually pick up a copy and read it yourself. [Click here to get your copy now.] I really do think it’s the most important church leadership book in a very long time maybe since “Purpose Driven Church” was published in 1995. Get some copies of it and read it together with your leadership team. I will definitely be buying the book!! Great thought-provoking questions!! Here is one I am kicking around. Are our churches developing counter-cultural, radical Christ-followers or just happy Christians?